Showing its barbaric face once again, the Punjab Police have today fired more than 200 gunshots toward Sikhs who were protesting against the desecration of Sri Guru Granth Sahib outside the historical Sikh shrine at village Bargari of Fridkot district. 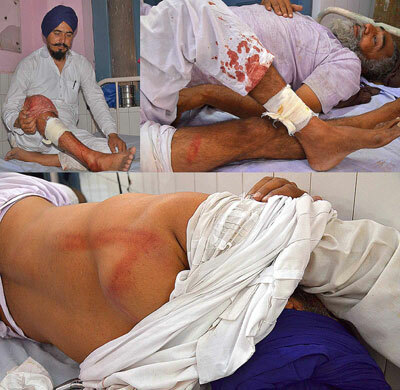 The firing has taken the lives of two Sikhs and left several injured. Two other Singhs’s are known to be injured severely. The deceased have been identified as Gurjit Singh, resident of Srawan village, and Krishan Singh, resident of Nimami Wala village. Reacting to the firing, Sikh demonstrators have set many vehicles ablaze. Next post Shaheed Bhai Kishan Singh Niami Wala Martyred by Moga police as he Peacefully Protested.